At the end of the nineteenth century women’s watches were mostly connected to the wrist. Edmond Jaeger was among those who avevando realized that the clocks were soon required a significant process of miniaturization, throwing a challenge he turned to look at the market who would be able to costruirglieli. An anecdote reports that no one answered at the Jacques-David LeCoultre, director of a factory that at the time realized very modern equipment. After meeting in 1903, Jacques-David LeCoultre and Edmond Jaeger signed a first agreement, but the company Jaeger, developing hitherto mainly marine chronometers and instruments, as it had not yet ventured into the construction of mechanisms of small . Both saw in this partnership the opportunity to complete a project for the times so innovative. The first step was in 1907, when it introduced the new Lepine caliber of 17 lines, often just 1.38 mm, the mechanical movement turned out to watch the world’s thinnest, a record still unmatched for that class of gauges. Many years later, in 1953, the brand introduced the Calibre 803, which with its thickness of 1.64 mm ushered in the era of ultra-thin wrist watches. Ten years after the Calibre 838 his successor was 1.85 mm thick, just two tenths of a millimeter in most but to integrate a fundamental anti-shock device. In 1976, the 900 automatic movement opens the line of gauges ultra contemporary of the House with a balance that oscillates at a frequency of 28,800 vibrations per hour and as the date for a total thickness of 3.25 mm. Among his descendants include the caliber 898C, mounted today in the Master Ultra Thin 41. It ‘was presented last week at the SIHH 2013 in two versions, one in steel with silver sunray dial and polished rhodium-plated indexes, the other gold colored dial with golden index and eggshell. 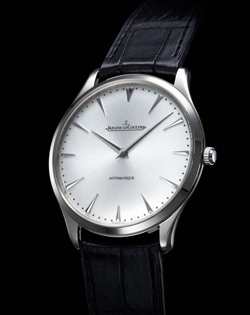 Following the label of an ultra-thin watch, the Master Ultra Thin 41 points all – besides lightness – on simplicity. It’s a solotempo and provides hours and minutes with two dauphine hands ignoring the continuous seconds: with a minimum height of elegance. In addition to the logo on the dial marked “Automatic” recalls the charging function autonomous with its thickness of 3.30 mm, the caliber automatic Jaeger-LeCoultre 898C has a power reserve of 43 hours. This Master Ultra Thin has a new case of 41 mm with a thickness of 7.48.